A simple guide to assist you with the next step in empowering your lifestyle. If you are new to automation systems, the technology and range of choices can sometimes be overwhelming, but with Z-Wave, the process is easy. All you need is an internet connection with a free Ethernet (LAN) port on your modem / router.  Smart Lifestyle Solutions will take care of everything else. The first step is to decide on 1 or 2 solutions that you would like to implement, such as lighting control or security. Then, simply select a gateway controller and a few devices to get started. You can then add to your system when you want to expand your existing solutions, or add new solutions. 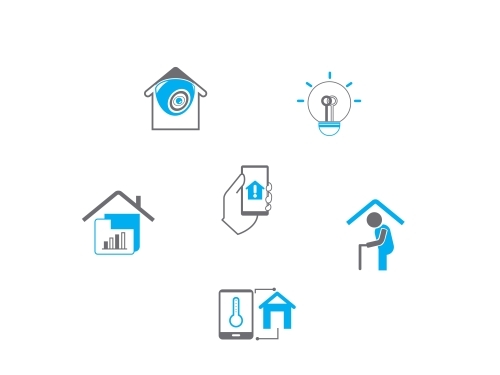 Z-Wave is modular, which enables you to add more solutions and devices with ease. 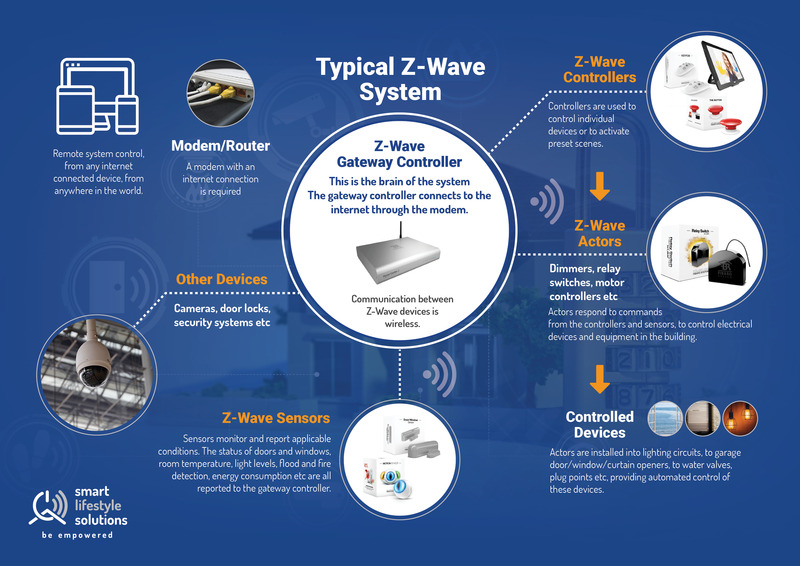 Z-Wave is wireless, so there is no need to install any additional wiring to your building, either during the initial installation or when expanding your system. It is advisable to select a gateway controller that will cater for your future requirements. This will ensure minimal setup time when new devices are added and will eliminate the need to become familiar with a new interface. The gateway controller is connected to the internet through your existing modem. The gateway controller is the interface which enables you to connect to and control your system from any internet connected computer, tablet or smart phone from anywhere in the world. It is also the "brain" that monitors and controls the inter-operable devices in your network. The gateway controller manages the automated features of your smart system by executing various commands in association with preset time schedules, or initiates actions when certain events occur. For example, your gateway controller can be programmed to turn on the house lights at a certain time of the evening, or make use of sensors to determine when it is dark enough to turn them on. The gateway controller could activate a water valve to shut off the water supply to the house, in response to a signal from a flood sensor in the kitchen. Once your gateway controller is installed and connected to the internet, you are ready to start adding devices to your network. Sensors to monitor windows, doors, motion, smoke, flood, temperature and power consumption. Sensors will monitor conditions and report the data to the gateway controller. Sensors can also be "associated" with other devices allowing them to communicate directly, as well as through the gateway controller. This ensures that critical system functions can still be performed if communication with the gateway controller is lost. For example, if the gateway controller is damaged in a fire. Controllers such as handheld, button, gesture and voice controllers, which enable you to control the individual devices in your building, or to activate preset "scenes". Scenes enable automated control such as turning on lights when motion is detected in a room, or enables the control of multiple functions with a single command. For example, dimming lights, closing curtains and activating your AV system when you press your "home theatre" button. Actors respond to commands received from the controllers, enabling the automation of garage doors, curtains, lighting, power points, air conditioning etc. Other devices such as cameras, energy meters, infrared devices, door locks, voice controllers and network devices can also be added to the system. It is important to decide which solutions you would initially like to implement, so that you only purchase the devices you need for your requirements. Please contact us if you would like us to assist you with your system specification, design or installation.